“My company/manager/CEO doesn’t understand SEO, my engineers have no idea on how to implement X, I don’t get the buy-in that I need.” Just some of the comments that I hear in real life and see pass by on Twitter. That’s why in late 2017 I asked this question on Twitter. So that’s why I thought it would be time for a write up on the scenarios that I’ve seen over the last few years in SEO and the other ways that I’ve seen that help for getting input. I’ll try to share some insights into how I’m/we’re dealing with explaining and dealing with SEO internally. Is there any believe in SEO? For a successful SEO strategy and great results the first thing that you’ll need is somebody in the organization needs to support SEO. If that person or role isn’t there it’s going to be really hard to get things moving forward. But how do you know that support is there. In my case I’ve been lucky, my first job at Springest I had a guy who started a SEO agency himself, TNW was such a big online tech player I didn’t even need to explain what SEO was and these days at Postmates I got specifically asked if I wanted to focus on SEO when I joined. All with the believe that SEO would help move the business forward. But in the end you don’t always need to have people that know what SEO is and know everything inside out. It will help if they’re able to help you out when you have questions of SEO and at least know the good and bad parts about it. If the person that’s asking you to help out is also talking about link buying I would probably reconsider my decisions to work for them a few times (and probably decide not to). What is the opportunity, how big is your industry/nice in terms of search volume? What is our current position? How good/bad are we performing against our competition? Who’s our competition really? It’s most likely not the companies that offer the same product but probably the ones that are beating your *ss in the search results. Increase conversion rate while they’re at it, increase awareness while they’re at it, increase referral traffic while they’re at it. These are just a few that additional values that you can bring to the table as an SEO (team) in a company. Most of all, if you do a great job on keyword research you can tell your internal organization a lot about the keywords and intent of the users within your industry/niche. But how do you proceed, to excel even more. In the end you want your whole organization to be supportive and help the cause of SEO. The more people that work on it the more you can hopefully grow your visibility and with that your relevant business metrics (clicks, leads, sign ups, etc.). Software engineers, executives, merchandisers, copywriters, user experience researchers, user interface designers, and product managers. Does your team know what SEO is, how it can help the company and what their contribution to it could be/mean? Very often I don’t see SEOs talk with the IT team/engineers/developers or whatever job title they’ll have in your organization. The often talked about phrase: “Sometimes you should just have a beer with them to build up a good relation” most often is incorrect. You’ll build up a better relationship, that I agree with. But that doesn’t always cover an actual understanding of the problem which is still going to be essential. 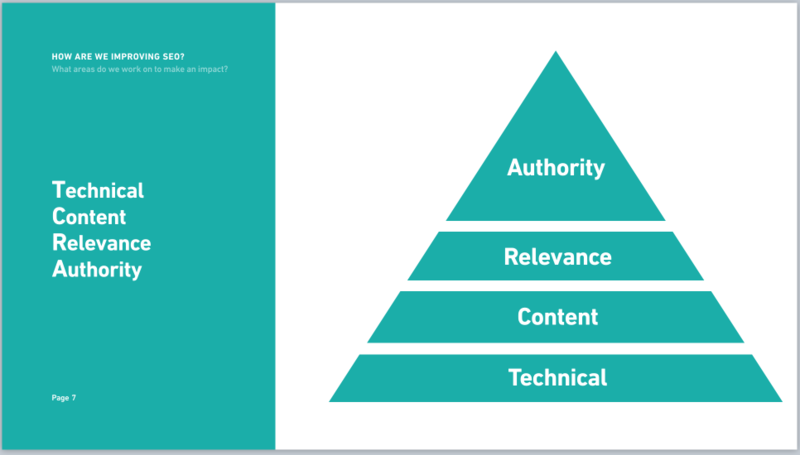 Does your boss, his boss and the CEO what you work on for SEO? Pretty sure that they don’t. So it’s not surprising that you don’t have all the support or resources that you would need. Start educating them, on what you’re working on and what the results are. If you’re in doubt about something there are multiple paths to go: run an experiment, launch an MVP as soon as possible or create the business case/technical documentation so you’re aware that you know what you’re building. “Why didn’t my engineer think of adding redirects?”, “Why didn’t our content team use the right keywords?”, “Why doesn’t my boss understand what SEO is really about?”. Questions that you must have asked yourself and I can’t blame you. But the answer to all of them is easy: “Because you haven’t told them”. In the end all these things matter to SEO and your success, so why don’t you explain it once more. Repetition makes it easier to have these answers printed on their minds. What can help me build up an understanding of SEO? Besides working with your team it’s even more important to work in a nice way with the other teams in a company. It’s very likely that there are more people outside of SEO in your company then there are working with it on a daily basis. All of these folks can help you out with SEO too. I remember the times where I was in desperate need for a copywriter after hiring dramas that continued for months and our receptionist turned out to be an English major and able to help out immediately. The previous two companies that I’ve worked for were relatively small (<75) and as I was an ‘early’ employee at both I saw a lot of people come in. In the end that made it easier to explain SEO to them as I either hired them or they had a manager that I already worked with within the organization. At Postmates that is quite different, I came in years after founding the company at the point where we had over 400+ people and a growing organization. 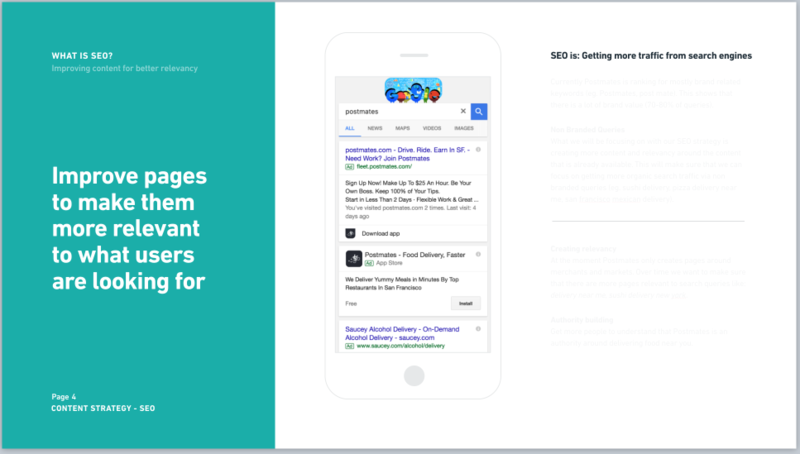 That’s why early on, when I was formulating the SEO strategy I started creating a slide deck explaining SEO for the rest of the organization and also telling them more about the projects that we already worked on or would be working on in the next months. Whenever a new team would be formulated or somebody would join the Growth team I tried to keep up with setting up a meeting with them and seeing if there would be any overlap or room to work together. In the end your Comms teams, Support teams have probably some interest in SEO or you can help them with their work with the tools, resources and/or products that you have available. Experiments started/finished: Do we have any results, or what did we launch this week? What did we do last week? What are the tickets that we worked on, what kind of early results do we have, is this already being picked up by a search engine? What are we going to work on this week? What issues will we work on, what kind of results might that provide, why do we work on this. What did we learn last week? What kind of results die we see, what kind of growth did we achieve. On top of that we send some headlines once a month for the bigger projects that we launched so we know what kind of progress we have made for the quarterly targets that we have. This will give a more birds eye view on what we’re achieving and if that’s on track with what we planned upfront. It’s a similar update to the Monthly one, but a bit more high level and readable for the whole team and people that don’t work with SEO on a day to day basis. This is still not good enough, even when you have internal support you always have new questions rise and even when they all support you it’s probably going to happen that they start asking deeper questions that you need to keep explaining. This is something I now endure, questions basically are more relevant to your own work. Which is awesome, as it makes up for great debates that in the end will only improve products and SEO strategy. Even better, this will all help streamline the process of SEO and usually speed up the output.